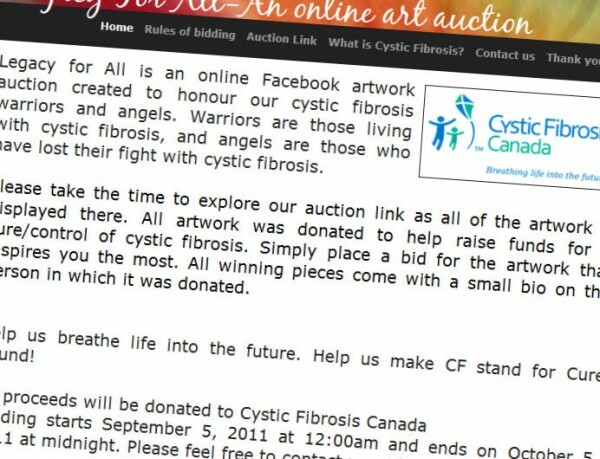 Legacy for All is an online Facebook artwork auction created to honour cystic fibrosis warriors and angels. Warriors are those living with cystic fibrosis, and angels are those who have lost their fight with cystic fibrosis. Artists from all around the world have donated pieces of their work to be placed online in hopes to raise funds to find a cure and control for cystic fibrosis. This unique fundraiser pairs the talent of many artists and modern technology to reach people all across the world. This fundraising event was created by Kingsville’s Kimberly Hasson who is a mother of two, Parker, 9 and her daughter Annika, 6. Annika lives with cystic fibrosis, in addition, Kimberly was also diagnosed with cystic fibrosis six years ago, after Annika was born with the disease. She is the Adult Representative for Cystic Fibrosis Canada, Essex-Kent Chapter. Her family and friends are loyal volunteers for Cystic Fibrosis Canada and are involved in several events each year to help raise funds for cystic fibrosis research and treatment programs in Canada. The online Facebook auction started September 5, 2011 and will end at midnight October 5, 2011. All proceeds will be donated to Cystic Fibrosis Canada, Essex-Kent Chapter.